We have been serving the Perth community with chiropractic, physiotherapy and massage since 2006. Other services include exercise physiology and injury rehab with Fitness First personal trainers in co-management of some of our patients. Racket sports like tennis can lead to elbow tendonitis referred to as tennis elbow. Tennis elbow is actually a term for pain, weakness, swelling and inflammation from repetitive overuse of the extensor carpi radialis brevis tendon in the elbow. 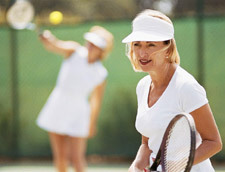 Common causes of tennis elbow include racket sports like tennis from small tennis handle, poor technique and grip, incorrect racket string tension and other causes. There are many chiropractic tests we use to help diagnose tennis elbow and your chiropractor will explain the best forms of treatment and recommend making alterations to sports and work ergonomics with coaches and health and safety respectively. Common treatments we use include cross friction massage techniques to break down the fibrosis, therapeutic ultrasound, stretching and modifying factors at work and sport. As a former Western Australian junior state tennis champion and tennis coach I know how physically demanding tennis can be on the body. Since the sport requires full body participation, a good flexibility, endurance and muscle conditioning exercise program are important to prevent injuries. Some of the most common tennis injuries are: Rotator cuff tendonitis/impingement syndromes, lateral and medial epicondylitis (Tennis and Golfer’s elbow), wrist strains, back pain, knee pain, calf/achillis tendon ruptures, ankle sprains and tennis toe. Rotator cuff tendonitis/impingement syndromes are muscle and tendon injuries of the shoulder. These muscles and tendons are attached from your shoulder blade (scapula) to your upper arm bone (humerus) and can become inflamed or impinged from repetitive overhead activities, such as a tennis serve. A tennis serve that consistently starts off at a 90 degree angle from the side of your body, increases the chances of this type of injury. Changing your serving technique to a serve which starts off at more than 90 degrees, preferably 135 degrees will decrease the chance of an injury to your shoulder muscles. Lateral and medial epicondylitis (Tennis and Golfer’s Elbow) is a repetitive condition caused by small tears and inflammation of the forearm muscles on the outside and inside of the elbow. It is believed that lateral epicondylitis (Tennis Elbow) is often caused by a faulty back hand technique and medal epicondylitis (Golfer’s Elbow) is often due to holding the racquet handle too tightly. Most physicians and tennis coaches will recommend the player use a two handed backhand to relieve the stress in the elbow and to switch to a looser racquet string tension, bigger racquet head size and a larger grip size, again to relieve muscle tension around the elbow when striking the ball. Wrist strains are another common tennis related injury, which seem to be due to new-age western grips for generating excessive top spin on the ball. When players strike the ball they rotate their palm upwards and quickly rotate their wrist in order to produce top spin on the ball. Switching to a more eastern grip (handshake grip) can reduce the amount of wrist rotation and therefore the strain on the wrist muscles when making contact with the ball. Back pain is usually related to an exaggerated arch or swayed back posture when serving, due to the player contacting the ball behind their head. The arched position can cause injury to the small joints and muscles of the spine. Advice on throwing the ball more out in front of the body to reduce the arch in the spine when contacting the ball can be made, as well as an abdominal core stabilizing and flexibility program to reduce stress on the spinal joints. Ankle sprains due to the quick and sudden directional changes on a tennis court and can be a common tennis injury. Inverted ankle sprains which effects the ligaments on the outside of the ankle are most common. A good tennis shoe to support the ankle with possible added counter support on the outside of the shoe and ankle strapping can be prescribed to protect the ankle. Frozen shoulder often occurs for no real reason to many patients afflicted with the sudden loss of movement in their affected shoulder.